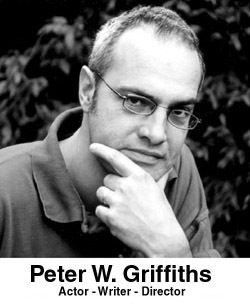 Peter W. Griffiths, Actor, writer, director. A phenomenal Welsh talent. There isn't anything this amazingly talented actor, writer and director can't do. He is, quite simply, one of the most respected blokes in south Wales. He also works tirelessly in the community and every year writes, acts and directs his own special Christmas show for the kids in the hospital and the old folks down the home. Peter is also a marvellous acting coach and most people who study under him go on to do other things. Peter is currently working on a film script, a novel a new play and a television series.